These professional Madan pin brushes are simply the best dog brushes for grooming we have found. We can not praise them enough. 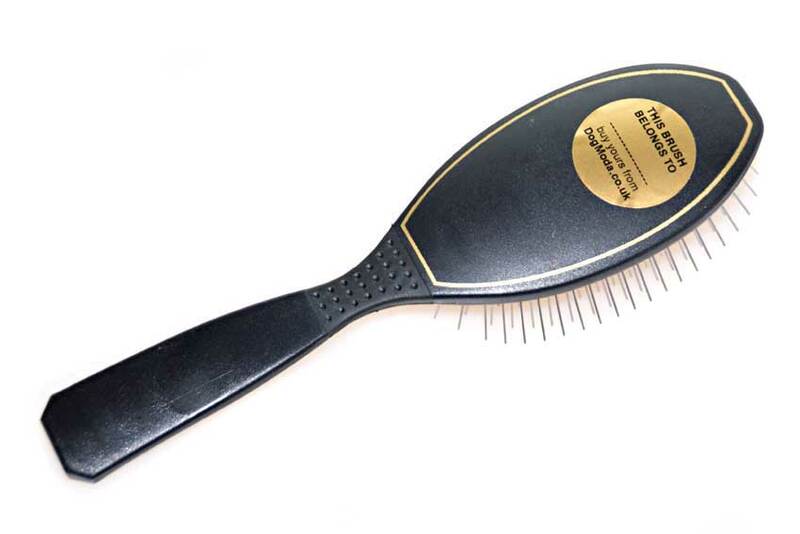 Having a firm cushion, these pin brushes are ideal for dense, curly and long coated dogs like Afghan Hounds, Chow Chows, Collies, Huskies, Lhasa Apsos, Old English Sheepdogs, Pomeranians, Poodles, Retrievers, Shepherds, Shetland Sheepdogs, Shi Tzus, Yorkshire Terriers and other double coated breeds that require regular grooming. 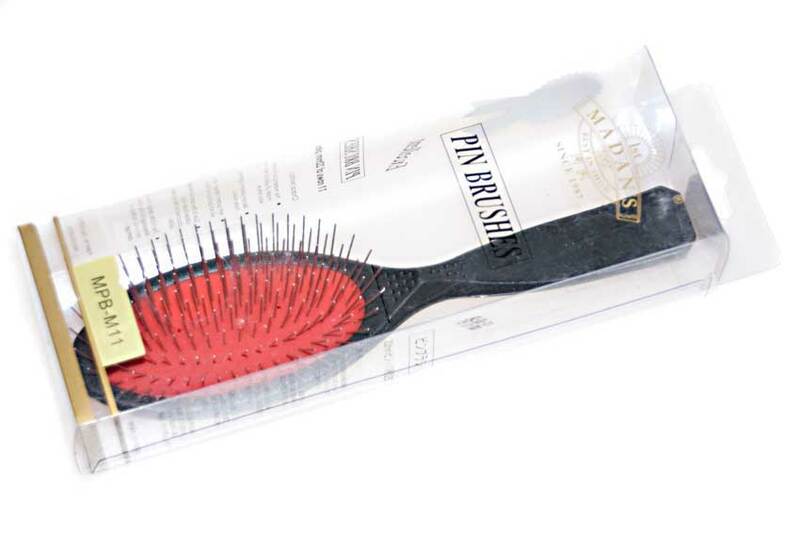 This pin brush is perfect for removing excess undercoat and easily brushes out tangles on these types of hair. A few of our customers report to use it on horses and their own hair too! 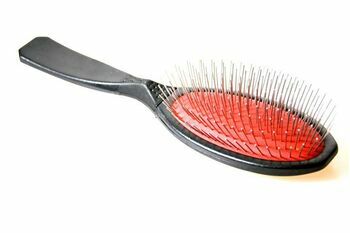 Black Madan pin brush has red firm rubber cushion with 11 rows of 22 mm pins that is manufactured with a patented design to prevent pins from being pushed in or pulled out. As a result, we get firm pin brush with no sunken pins. Moreover, Madan brushes are made to last. We still have the first one we got our hands on which is over 15 years old and has survived weekly grooming sessions and numerous dog shows. Its head measures 6.5cm / 2.5" across and 11.5cm / 4.5" high, while the overall length is just 23 cm / 9" long. At the same time it is a lightweight at just 74 grams. Body is made from special thermoplastic polymer material with silicon rubber, creating brush with superior strength, hardness, rigidity and toughness which is little affected by temperature and atmospheric conditions. This pin brush has an ergonomic handle with anti-slip grip and follows a Kinesiology design to avoid professional damage and groomer's fatigue. This professional pin brush from Madan is simply the best pin brush for dogs we have ever used. We are delighted to be able to offer this dog brush as the UK supplier at such a low price. Moreover, because we know that at some point you will get bored with the colour and would want another one, we have great discounts when you buy several dog brushes. To prevent your Madan brush from going missing at dog shows, we will give you a special sticker with every purchase of pet brush from Dog Moda. This will help you not to lose your Madan pin brushes at dog shows! 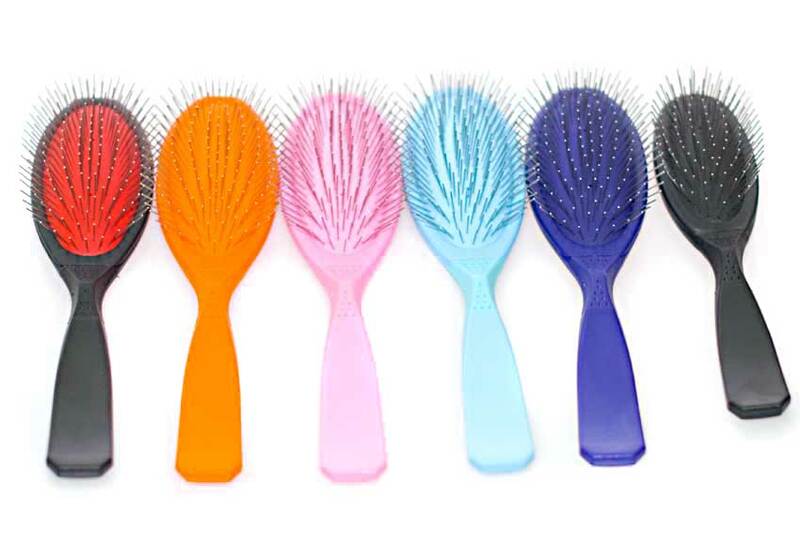 Please feel free to contact us if you need any help selecting the best pin brush for grooming your dogs, we will be more than happy to help you. I love this pin brush - have tried other ones in between but always came back to this brush. I have three now and the oldest must be more than 5 years old - still useable but I do like some "fresh" ones after a couple of years. Dog Moda service is brilliant and delivery always instantly - can only recommend and thank you! This pin brush is great but not for the tiniest dogs. It is larger than I thought it would be. Great go to pin brush for my yorkie! This pin brush is amazing! Makes grooming my havanese so much easier. My maltese actually lets me brush her with this pin brush, and the brush has a nice, quality feel to it. Recommend! Can't find a better pin brush for old english sheepdogs. Love this pin brush for my Yorkie. I've tried 3 different brushes and two combs but this brush is the best! Yes it is slightly more expensive but so worth it. Wish I would have just gotten it the first time. 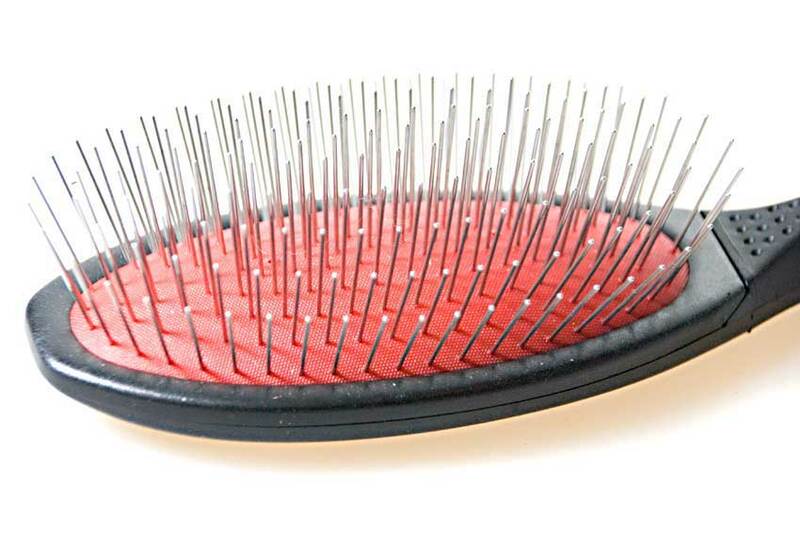 My Yorkie used to hate it when I brushed his hair - that was until I found this brush. Now we have absolutely no problem - he sits still and the job is done happily. The brush is extremely well made and I would highly recommend it. In fact, I ordered a second one for my daughter's dog and she is also delighted with it.